These chords are an absolute 'must' for all beginners. They will set you on the right path and enable you to play the easiest of chords in preparation for the next learning phase. Once you become proficient at playing these chords, it's time to move on to a more comprehensive range of chords including barre chords, power chords, moveable chords and we include enough chord theory along with easy formulas and examples to help you understand how chords are formed. Free software is avalable to view chords and notes over the entire fretboard. Power chords - the most popular power chords with the root note on the 6th string and root note on the 5th string...If you love playing electric guitar with distortion, you can learn how to play power chords. They are easy and fun to play - and your distortion will sound a lot cleaner too! Each chord type has 12 chords, with each chord being displayed in 3 different positions on the fretboard. The chord charts display the finger positions for each chord as well as displaying the notes of the chord including fret positions, barre chords, open positions etc. Our charts are displayed in a natural playing position, therefore you read the chart as if you are looking down on the guitar while you are playing. The nut of the guitar is on the left of the chart and the bridge is on the right with the opposite for left-handers. Once you get used to the charts, they become very easy to read. You no longer have to look at a chord chart and twist it round for it to make sense... you play it as you see it. PS. 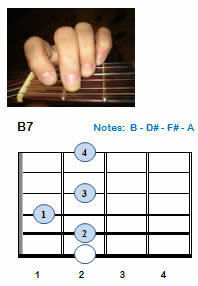 The B7 chord displayed here includes an optional note (white circle) which is not normally played as shown in the picture. If you do play the optional note, you will need to cover the 5th and 6th string with your second finger - a little awkward at first but much easier with practice. Here you will find chord charts to the most widely played chords from each of the 7 natural keys including: M, 7, m, m7, maj7, sus4, 7sus4, 6, m6, 9, m9, maj9, 6/9, 7+9, 7-9, aug, 7+5, dim, dim7, -5, 7-5, 9-5, 11, 13. For those of you wanting a closer look at each of the popular 'A' chords in chart, written and tab form. These are chords that can be played over the entire fretboard using the same shape. They utilize open chords and barre chords in a variety of shapes depending on where the root note is located. There are positions for the root note on the 4th, 5th and 6th strings as well as the 5th note of the chord on the 5th and 6th strings. These chords are invaluable... they allow for variation and greater flexibility in your playing style. They are ideal for jazz players and anyone wanting to add a new dimension to their sound and playing style. To play these chords, you must know the notes on the fretboard, or at the very least the fretted notes on the 5th and 6th strings. Makes sure you look at the guitar notes page for a full run-down of all the notes on the fretboard as well as some handy tips to help calculate the notes with my simple 5554 rule. Unichord is a program to show the finger positions and notes for any of the sixteen most common chords, in any key, on the fretboard of any fretted string instrument in any tuning. In addition to three pre-set instruments - Guitar in standard EBGDAE tuning, Mandolin in standard EADG tuning, and Bass Guitar in standard GDAE tuning - any user-defined instruments may be configured, saved and re-opened. The sixteen basic chords are available along with the seven modes. These can all be displayed using any tonic note (i.e. the finger position and notes for a minor seventh chord can be displayed for any of the 12 possible chords - Am, A#m, Bm, Cm, C#m, etc.). Custom chords can also be defined. The displayed chord or mode may then be printed. In addition, the seven scale tone chords for any key can be printed, each on a separate fretboard. This program is designed to run on Windows 10 but may run on earlier versions. Many thanks to Ron for providing this free app. We found it very useful as the chord positions are available over the entire fretboard with the ability to switch between note positions and note names. All the popular chords are available and you can view the modes for each chord along with scale tone chords for all major and minor keys. Please Note: The latest version (2.3), released - Sept 2018 also caters for left-handed guitarists. The app is ideal for all levels of experience. You will need Adobe Reader (the latest version is recommended) installed on your computer in order to open and read all the free chord charts that you download. You can get Adobe Reader here (a new window will open so you can download it without leaving this page).